Chinese President Xi Jinping (L) is set to have his signature ideology of 'new era thought' inscribed in the Chinese Communist Party's constitution next week, symbolising his ascent to a position within the party reminiscent of that of Mao Zedong (R), the founder of modern China. Chinese leader Xi Jinping's name was added to the Communist Party's constitution at a defining congress on Tuesday, elevating him alongside Chairman Mao to the pantheon of the country's founding giants. The inclusion of Xi's name along with his guiding philosophy for the nation cements his place as the most powerful Chinese leader in decades and suggests he could remain its paramount leader throughout his lifetime. Communist China's founder Mao Zedong, and the architect of market reforms, Deng Xiaoping, are the only other Chinese leaders to have their names in the document -- and only Mao was alive when his was included. Xi, 64, presided over the week-long congress's closing session where some 2,300 delegates approved the constitutional amendment to include "Xi Jinping Thought on Socialism with Chinese Characteristics for a New Era". An official reading out the amendment said the concept will be "a beacon for the work of the party". "We must work tirelessly and forge ahead on the journey of realising the rejuvenation of the Chinese nation," Xi told the congress in concluding remarks. Willy Lam, politics professor at the Chinese University of Hong Kong, said adding Xi's name to the constitution will "enable him to be like Mao, leader for life as long as he's healthy". Xi's predecessors, Jiang Zemin and Hu Jintao, had their concepts included in the constitution but without their names and only when they retired. The congress will also undoubtedly hand Xi a customary second five-year term as general secretary of the party. Xi could also consolidate his power by filling the country's ruling council with allies, possibly without even presenting an obvious heir apparent. The congress also elected a new Central Committee, which will choose the executive Politburo and the country's top ruling council, the Politburo Standing Committee, on Wednesday. A vast security apparatus has been thrown around the congress, with businesses ranging from nightclubs to gyms closing to avoid any incidents and factories shuttered in what so far has been a failed attempt to clear the city's notorious smog. When he opened the gathering last week, Xi declared that China had entered a "new era" with the ambitious goal of becoming a "global leader" by mid-century. His bold vision comes as Xi has sought to portray himself as a responsible global leader while President Donald Trump trumpets a nationalist "America First" policy and the European Union grapples with Britain's exit from its club of nations. Xi's blueprint suggests the Communist Party will continue to increase its control of the country, with no suggestion that crackdowns on human rights activists will wane. Some of his goals, such as building a modern military by 2035, go beyond the end of his second term, suggesting that he also foresees himself staying at the centre of China's political life for years to come. But despite Xi's rising power, the composition of the Politburo Standing Committee, the body that controls power, will still be crucial to Xi's efforts, Lam said. Xi and Premier Li Keqiang are expected to remain on the committee while the five other current members are supposed to step down under an informal retirement age set at 68. There is no consensus among China watchers about who will end up on the committee, or if anybody will emerge as a potential successor. If the right allies are named, it would show that "he has full control over the Politburo Standing Committee," Lam said. 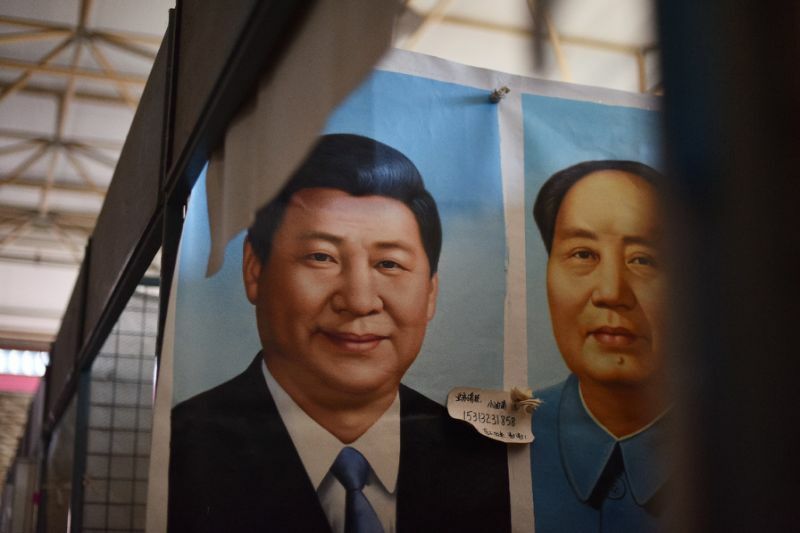 Chinese leader Xi Jinping's name was added to the Communist Party's constitution at a defining congress on Tuesday, elevating him alongside Chairman Mao to the pantheon of the country's founding giants. The inclusion of Xi's name along with his guiding philosophy for the nation cements his place as the most powerful Chinese leader in decades and suggests he could remain its paramount leader throughout his lifetime.